I honestly don't even know where to start with this review, besides to say that I absolutely loved this book! I know that pretty much every single person who has read it has said that, BUT it is true! I promise you! I keep looking at the above quote from Publisher's Weekly and think that it pretty much sums up what I am about to try and say, because it really was emotional and raw. I 100% felt like I was reading a book about real people in real life. These "characters" didn't feel like characters to me. They felt, acted, and sounded like real people. 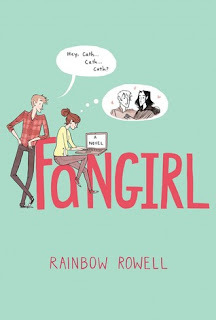 I loved the integration of including samples from the "real" Simon Snow series and Cath's fanfiction at the end of each chapter. I found it to be super interesting and it made me want to read those stories too. Lucky for us, Rowell is actually writing the full Carry On story and will be releasing it this year. I think I might actually read it. I found it so interesting to watch Cath struggle with keeping everything together. Simon Snow is her security blanket. With her now in college, away from her dad and not sharing a room with her twin sister Wren for the first time, she needs something to hold on to. That something is Simon and Baz. It was so nice to be so deep in someone's mind. We saw, heard, and felt everything that Cath did. When she was upset, I was upset. I found it really cool that we hear and know everything going on in Cath's mind, but when it comes to actions in Cath's real life there were subtle nothingness thrown in. She wouldn't give us full details in some area's, but we knew what she meant and what was going on. Like she never verbally or mentally said she wasn't talking to her sister for months, but for awhile there was no mention of her sister. Or the part where I am pretty sure she loses her virginity, but she doesn't go out and say it. The ending is what really got me. I was not ready for it to be over. I wanted more. I needed more! Is she 100% happy and in love? Did she pass her fiction writing class? DID SHE FINISH CARRY ON IN TIME!? I. dont. know. and that kills me a little. lol. I am absolutely in love with this book! It was serious so good. The best part was that it all felt 100% genuine and real. I still don't believe that these are characters. I feel that Cath, Wren, Levi, and Reagan are real people in real life. It honestly read like that. I loved how open and real Cath is with the reader. She is so introverted and distant from others in real life, but completely open and raw with the reader. I highly recommend this book to everyone. I promise you will love it! AND I can't wait to read Carry On!